This elaborate altarpiece is one of the most impressive Hindu bronzes to survive from the Pratihara Dynasty (805–1036) of north-central India. Vishnu affectionately embraces his wife Lakshmi, and the divine couple is surrounded by his various avatars or incarnations. The supreme form of Vishnu is placed at the peak of the arch, in which he sits in deep mediation holding his primary attributes the club and wheel. 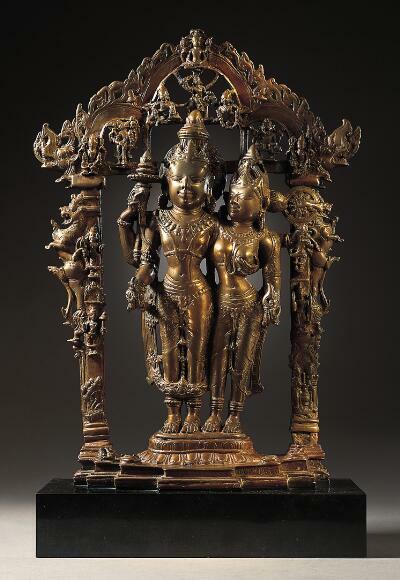 At the center of this sculpture stand the Hindu god Vishnu and his consort, Sri Lakshmi. Vishnu, worshipped as the creator and protector of the universe, manifests himself in various heroic forms, known as avatars, to save the earth from evil. Vishnu creates, destroys, and protects the worlds. . . Some scholars, however, see Lakshmi as Vishnu’s energy, doing the work of creation for him while he lies inactive. The couple’s embrace suggests creation, its force balancing the destruction signaled by Vishnu’s weapons and the avatars which surround him. The arch behind the couple is adorned with small images of several manifestations. Over Lakshmi’s head, for example, appears the Man-Lion…. Hovering directly above Vishnu is the warrior Kalki, who rides a white horse…. At the base of the sculpture, you can see fragments of feet; the remnants, perhaps, of tiny devotees.